The overall resilience of the state’s agricultural sector conceals some important negative local impacts. While state crop revenue and employment remain high, there are winners and losers. The study highlights that crop production was buffered through extensive and unsustainable overdraft of groundwater. Although detailed county-level acreage and revenue data are not yet available, the drought is likely having its largest impact on local economies in areas with extensive fallowing. Fallowing has reduced farm jobs in those areas, and while some may have found work elsewhere, others have not. Farms also have adopted more efficient water management technologies and practices, such as drip irrigation, and switching from lower to higher-value crops – helping boost revenue within the limits of available water. Finally, farmers, have sold water to other farmers growing more profitable crops, as well as to municipalities, industries, and to a limited extent, for environmental flows, further boosting agriculture revenue. The Pacific Institute estimates that voluntary sales from agriculture to non-agricultural users boosted agricultural revenue by at least $66 million in 2014, offsetting some of the losses from fallowing. Better data and more research are needed to understand the broader social and environmental impacts of these water sales. Ultimately, California agriculture is changing in many ways to withstand the ongoing drought. The study concludes that California’s economy and job levels have not been adversely affected by the drought only through a series of responses, some of which will build resilience while others will have lasting and damaging consequences to local communities, ecosystems, and future generations. 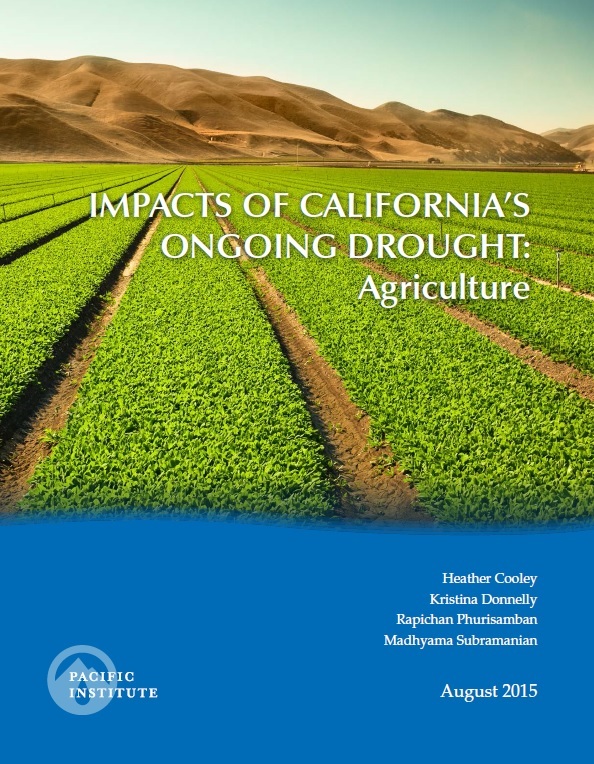 The protracted drought provides policymakers, farmers, and agriculture officials a unique and urgent opportunity to plan for and implement more sustainable water use policies and practices to support a vibrant and sustainable agriculture sector in California.